The Life and Travels of The Ellingers: Ski Season 2009 Condensed! Emily and I got a lot of great days in this year. It certainly wasn't the snow we had last year that allowed me to front flip a 30+ foot cliff but it was enough for me to finally land a 40+ one straight to flat without hurting myself (the cliff in the photo of two kids looking over the top of it) as well as stomping my first 360 off a cliff band. Emily upped her game considerably learning how to jump turn and even huck a small ledge on the Upper Bowl (she is wearing the red jacket in the photo below). I would often use her as a prop in photos jumping over her head (thankfully she trusted me - look for her in the photos underneath me). The first time I jumped her (the photo of her under me below) I sailed far further than I had planned (50+ ft) and almost landed myself in a tree! I skied most of the season with Chris Holm who absolutely has amazed me with his skiing ability only having started last year. 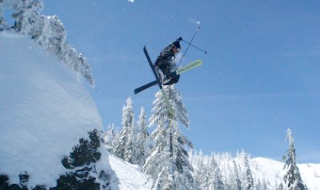 He's hucking significant ledges at SkiBowl and has been a great friend in taking shots of me hucking my own carcass. Two weeks ago the skiing community lost one of it's hero's with the death of Shane McConkey. He has been my favorite skier for about 10 years now progressing the sport beyond what was thought possible. He basically invented ski base jumping (how he died) and revolutionized the ski industry with the first reverse side-cut spatula ski. His K2 Pontoon ski is the best selling powder ski in history winning awards for several years now. I hope to pick up a pair for next season. It sucked hearing that he died filming for MSP in Italy. He was a local in Lake Tahoe and a Squaw native. I was fortunate enough to meet him briefly at a donut shop in Tahoe while skiing there on vacation in 2005. He was a great guy and near the age of 40 he gave me hope all the time that I could still do amazing things on skis despite almost being 30. He will be missed. So, rather than post weekly the best shots from the season I've condensed the best ones of the season into this lengthy post. Enjoy!